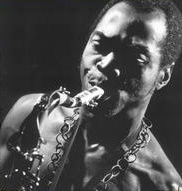 Here is my humble Fela Kuti website. You will find reviews of his classic albums, sound samples(in RealAudio), and historical information. You are visitor (since May 26, 2000) according to Web Counter.